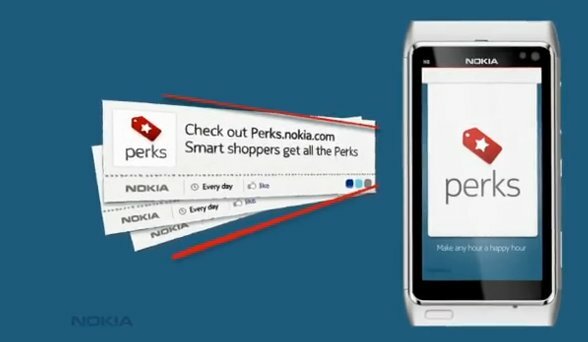 As CJ found in leaked videos (already taken down) Nokia are apparently going to be releasing something called “Nokia Perks”. It’s a smart shopper service, a bit like Groupon’s coupons. Find your offer, get your coupon, find directions. So if you go to perks.nokia.com (not open obviously, being leaked) search for your particular relevant deal, save this and add to your offers. Your done. The coupon is there in your phone. When you’re ready to pay just click ‘redeem’ and show the code to the cachier. They also seem to have ‘easy booking’ feature for restaurants. Find local restaurant, book a table, from your phone. To get to offers you actually want, you can subscribe to your favourite brands. I hope Nokia will take the social location bit more seriously, as groupon does. This is why groupon has worked. Local offers in your area. Having said that Ive used groupon once and have marked all future groupon notifications as spam for their constantly irrelevant offers. At least with Nokia Perks, you can pick brands you may often find yourself buying and be updated on their offers. Also, unlike Groupon, I don’t think you have to “pay up front” first to take part in the discount. In Groupon, you have to put in your payment details to put your money collectively in for a group discount. If you reach the target amount of people, the coupon is released and payment is taken. I hope maybe they can bring out “interests” and send you offers of things you’ve shown or selected are you would be interested in buying. I’m not sure Nokia can pull this sort of thing off though. There are videos on Vimeo and YouTube but Nokia has swiftly pulled them.